Nozawa onsen village is located in the north of Nagano prefecture, and has been designated a part of Joshin’etsu Kogen National Park thanks to its beautiful scenery. The cobblestone streets, multitude of “Sotoyu” hot springs and dramatic traditional events have made Nozawa the quintessential winter snow resort experience. Nozawa onsen ski resort extends from the 1650-meter peak of Kenashi-yama to the mountain’s foot, for an altitudinal range of 1,085 meters and a total area including ski slopes and courses of 297 hectares. 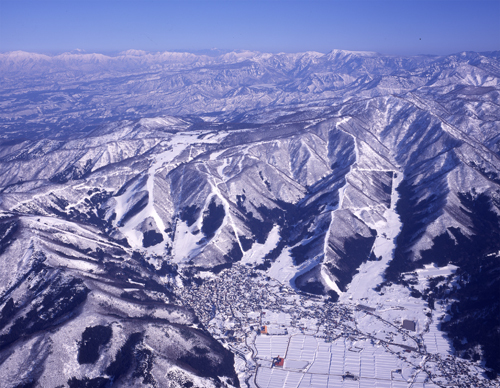 It is ranked as one of Japan’s top ski resorts in terms of size, history, and snowfall. Plenty of 100% natural high quality snow—often very dry powder—makes skiing possible well into the warm month of May. Ski slopes are connected by a total of 21 lifts and other facilities, including 7 high-speed lifts. There are 36 ski slopes including the exciting Snow Park, and an extremely long course of 3,500 meters. With its variety of slopes and courses, Nozawa onsen Ski Resort is suitable for everyone from advanced skiers to beginners and families, and can be fully enjoyed by both skiers and snowboarders. Famous for its historic and traditional ski resort, Nozawa-onsen village is well renowned among onsen (hot-spring) areas dotted around Japan. 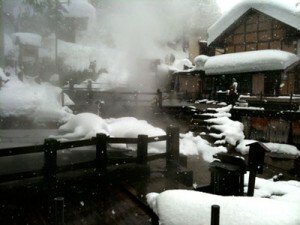 An “onsen area” is a district with many natural hot-springs where hot water flows naturally from the earth. The place where the hot water flows out is called the gensen. 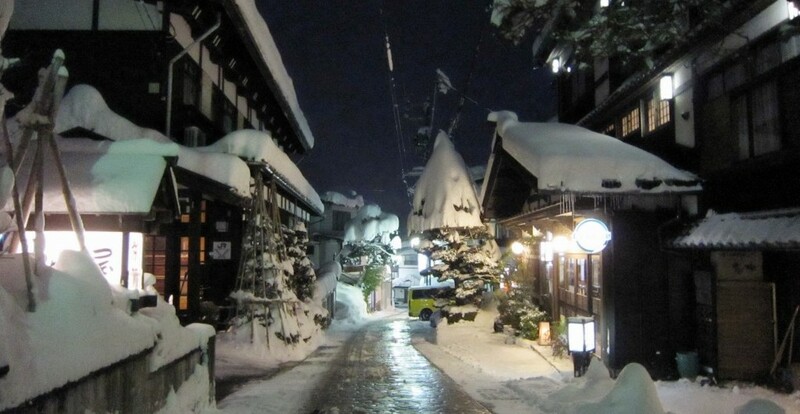 Nozawa onsen-mura is a small village located at the foot of Kenashi-yama, a mountain that has a gensen at its center. There are various stories explaining how the gensen was discovered. Some say that it was discovered by a group of ascetics called Yamabushi who were training themselves by roaming single-mindedly deep in the mountains, while others claim it was found by a hunter who followed an injured bear that happened to lead him there. There are many other legends too, so people must have known about the hot springs around Nozawa since quite a long time ago. Time passed since then, and present-day Nozawa onsen is a popular hot-spring health resort thanks to efforts in environmental improvement and other areas. In the village’s Onsen district there are thirteen atmospheric public bathhouses called Soto-yu, and visitors can sample several of them on a relaxing onsen pilgrimage. 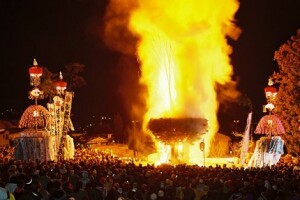 Nozawa is also famous for winter events, the most well known being the Dosojin Fire Festival held every year on Jan 15th. A spectacular traditional festival, this is counted as one of the three major fire festivals in Japan. This is the village’s largest and the most important annual event which is very impressive and exciting when the sparks fly from the torches. Catching the Shinkansen Train and Bus is the most common transport to Nozawa Onsen. From Narita Airport, catch the Narita Express (NEX) train to Tokyo Station (1 hour). There are frequent departures from the airport railway terminal. Upon arrival at Tokyo Station take the escalators up and follow the green signs for the Shinkansen. The platform number for departure is usually about 20-23. Check Hyperdia for schedules. The Shinkansen from Tokyo station to Iiyama station takes about 2 hours. The most economical way to cover the fares for the NEX and the Shinkansen is to purchase a JR East Pass. For train travel from Nagoya, Osaka, Kyoto or other parts of Japan, seeHyperdia for routes, schedules and fares. Taking the Nozawa onsen Liner bus at the Iiyama station to Nozawa onsen. The nearest bus stop to Kawaichiya ryokan is “Nozawa Onsen” which is last one, but the place of the last bus stop is different depending on the season. Taking 3 minutes walk to Kawaichiya ryokan anyway.